JayJay Jackson, Production and Design Director for Illustrated Media Group, LLC, was trained at the University of Texas, New York’s School of Visual Arts and the New York Academy of Art. Jackson began her distinguished career in 1982 as a senior designer and production specialist for Texas Instruments, where she designed and produced posters, brochures, catalogues, newsletters and other graphics. In 1984, Marvel Comics hired Jackson as a graphic designer. Jackson brought a state-of-the-art sophistication to Marvel’s advertising pages, feature pages and non-comics editorial pages; and introduced a number of cost-cutting and technological improvements to Marvel’s printing and production processes. Her outstanding work and thorough mastery of printing and production led to a rapid promotion to Art Director of Advertising. In that role, Jackson developed Marvel’s first point-of-purchase program, first in-store advertising campaigns and first print media campaigns outside of Marvel’s own publications. 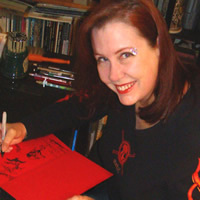 In 1989, Jackson was hired as Executive Art Director by a start-up comics company, Voyager Communications Inc., which published under the VALIANT imprint. Jackson developed and directed the company’s inaugural advertising and promotional efforts, designed all VALIANT’s ads, point-of-purchase materials, premiums, promotional items, trading cards and dealer loaders. She also designed logos, non-comics editorial pages and covers. She developed a new color separation system that produced better results at lower cost and gave VALIANT comics a distinct and superior look. Jackson also contributed to the comics’ editorial content, serving as lead color artist and designing characters, costuming and locales. VALIANT quickly became the third largest and by far the most profitable comics publisher in the U.S., due in no small part to Jackson’s efforts. In 1992, VALIANT was awarded the industry’s most prestigious honor, The Diamond Gemmie Award for Best Publisher. At VALIANT, Jackson designed and produced custom comics for a number of major clients, including Kraft General Foods, Kentucky Fried Chicken, MCA Records, Nintendo of Japan, Tiger Toys and others. Her technical expertise enabled VALIANT to produce higher quality products for its clients, employing any printing technique imaginable, at a cost below any competitor’s. In 1992, Jackson was hired by Enlightened Entertainment Partners, publishers of DEFIANT comics, as Creative Director. As at VALIANT, she contributed extensively to the editorial and production efforts. Jackson designed several in-house premium and promotional custom comics which were watershed advances in the state of the art. Jackson was recruited by Broadway Video Entertainment in late 1994 as a creative consultant. Soon thereafter, BVE launched Broadway Comics and named Jackson Executive Editor and Art Director. During her tenure at Broadway, Jackson completed courses in computer assisted design, web design and computer graphics, adding those abilities to her already impressive skill set. After Broadway Video Entertainment was sold to Golden Books Family Entertainment in 1996, and the direction of the company changed, Jackson accepted the position of Art Director of Marketing for Display Technologies, Inc., a Long Island designer and manufacturer of point-of-purchase displays and marketing materials for major national brands including Coca-Cola, Pepsi-Cola, Nabisco, Timex, and many more. Jackson created, designed, prototyped and produced custom displays and point-of-purchase sales builders; designed sell sheets, brochures and sales videos; and designed, built and maintained web sites for a number of clients as well as for Display Technologies. In 2000, Jackson was hired by M2 Design Group, Inc., a New York City based boutique design house, principally serving the recording and fashion industries. Jackson designed web sites, album packaging, ads, brochures invitations and presentations for clients including Atlantic Records, Puff Daddy’s Bad Boy Records, Epic Records, the Isley Brothers, Macy Gray, Aaliyah, Tyrese; and did advertising and design work for Sean John Clothing, Ecko Unlimited and others. At M2, she was often tapped to do photography, or art direct photo shoots. She also designed sets and retouched photos. In the spring of 2003, Jackson accepted an offer to bring her wealth of skill, talent and experience to Illustrated Media Group.